We are trying to collect dilute erratic energy, spread over hundreds of square kilometers in windy, salty, and wet conditions with machines that spin at 330km/hour. What could possibly go wrong? From: “Offshore wind fiasco” at GWPF – The original story in Danish. The cost of repair is so small they need to keep it a secret. But it can’t be cheap. For the most repairs, the blades need to be brought down, shipped and fixed on land. Repairing them at sea is a rare feat. This must be the infamous leading edge erosion. Large rotors lead to large yields, but also to lots of annoyance – at least as far as the coating is concerned. After only a few years, the protective layer that is supposed to prevent erosion is already worn out. Materials that really last for 20 years are still being worked on. The ever larger rotor blades have led to increasing rotation speeds of the blade tips. Offshore, speeds of up to 90 m/s are now reached. This is around 330 km/h. At these speeds, raindrops and hailstones hit the coating like bullets and remove the erosion protection like a pressure washer. After that, the rain washes away the rest of the coating layers and in the worst case exposes the blade structure. The tips and the leading edges of the blades are most affected. Because the aerodynamics also get ruined along with the protective coating, the repair costs are accompanied by a loss in yield for the operator. Various studies estimate these losses to be between 4 and 10 %. If delamination sets in, this can quickly rise to 20 %. It would already be an improvement if the erosion protection lasted six to seven years on the blade tips…. Apparently the protective coatings need a protective coating. There is a steep loss of power as the leading edge erodes. Significant blade erosion could cause up to a 5% power loss each year, according to Blade Dynamics sales and marketing manager Theo Botha. The lifespan of a wind turbine offshore is supposed to be 25 years. Back in 2012 land-based wind farms in the UK were found to show signs of wearing out in just 12 years. For onshore wind, the monthly ‘load factor’ of turbines – a measure of how much electricity they generate as a percentage of how much they could produce if on at full power all the time – dropped from a high of 24 per cent in the first year after construction, to just 11 per cent after 15 years. 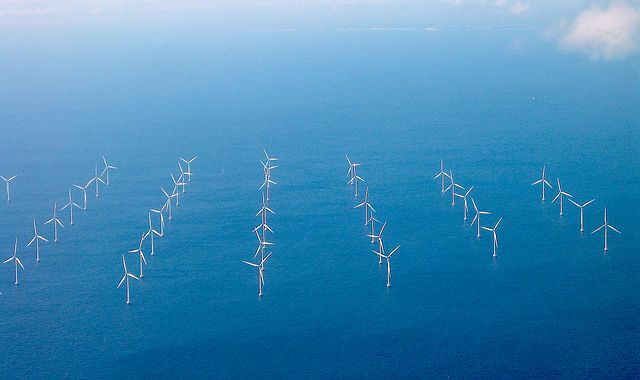 For offshore wind –examined only in Denmark where it has been used for longer – it declined even more dramatically from over 40 per cent at the start, to just 15 per cent after ten years. The bigger wind farms were less efficient than the small. There is a five year guarantee on the rotor blades.